After 9 rounds, the field of 793 was boiled down to 266. That's still a healthy representation of the mature Standard metagame and we're here to share the Top 12 Archetypes with you. Most of the numbers here correspond to the numbers from yesterday, but what we'd like to delve into a little more is the conversion rate. 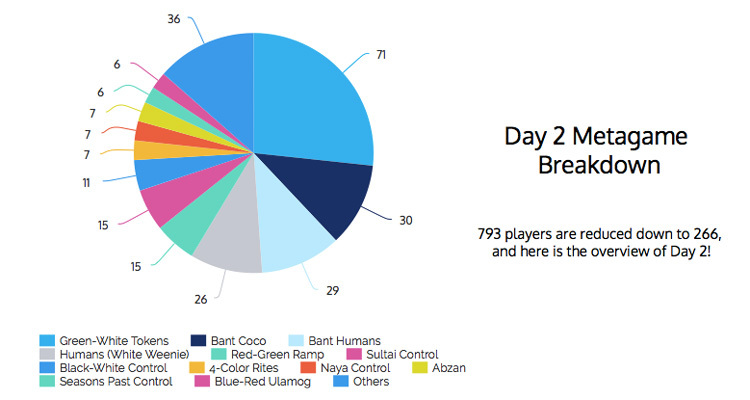 For example, 171 players showed up with Green-White Tokens yesterday, putting 71 players through to Day 2. This represents a 40% conversion rate, which is an indication of the deck's performance yesterday. Looking at the data above, Humans has got a poor conversion rate of only 30%. Despite it being potentially very explosive, it doesn't quite stack up in the mid-to-late game once things spiral out of control and the board gets gummed up. A few of the lists lurking around the top tables are playing as many as 20 one-mana creatures, increasing the effectiveness of Thalia's Lieutenant significantly, but this "all-in" approach is literally make or break. Bant Coco and Bant Humans lend strength from Collected Company, a superbly powerful card that allows creature-loving players to cheat on mana costs, dig for a specific utility creature, populate the board or rebuild it after suffering heavy losses from Languish or Tragic Arrogance. In particular, Bant Company spots a 60% conversion rate, which indicates that it is a force to be reckoned with. Nearly a quarter of all players in Day 2 are sporting this format-defining instant, and the trend will likely stay this way until Dragons of Tarkir rotates. Of note are also the Sultai Control decks, which have been serving their pilots very well. Some of the Seasons Past Control players are also splashing Blue to include Dragonlord Silumgar as a tool to beat the Planeswalkers found in Green-White Tokens, which means that almost 20 players have adopted this strategy. Black typically gives the control access to quality spot removal (Ultimate Price, Grasp of Darkness and Dead Weight) and mass removal (Languish), but one crucial part of the puzzle is the ability to run Dark Petition. This enables the control deck to play silver bullets and a toolbox sideboard, opening up the doors to usually narrow options such as Virulent Plague for instance. You'll also be able to find Seasons Past to regrow your entire graveyard, or grab the best card you need if you find yourself in a fix. 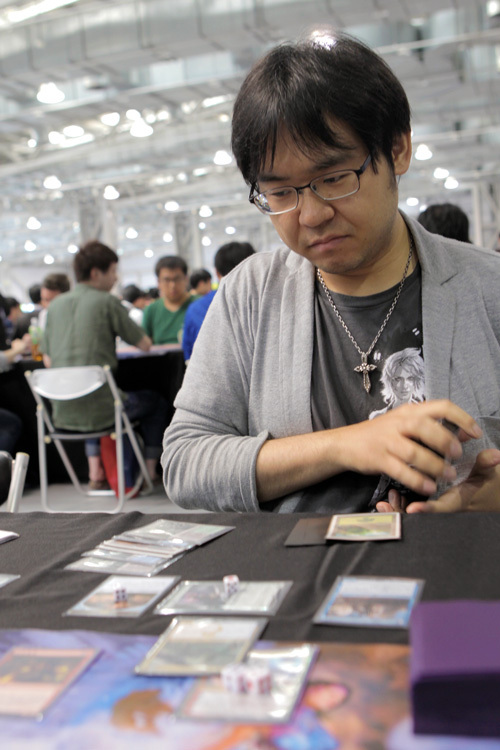 Makihito Mihara is on Sultai Control this weekend. As we step into Round 12, the Top 8 is starting to shape up.